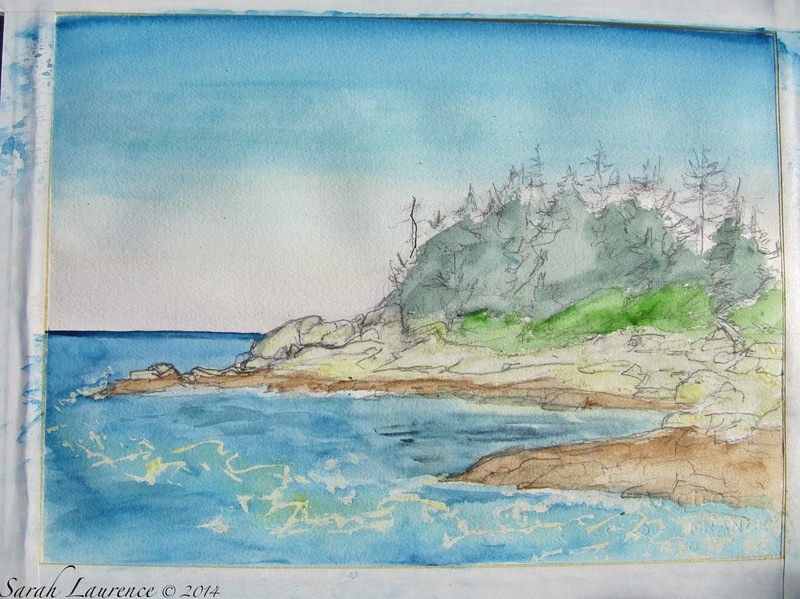 On this wintery March day (6-10 inches due), I'm longing for watercolor weather. 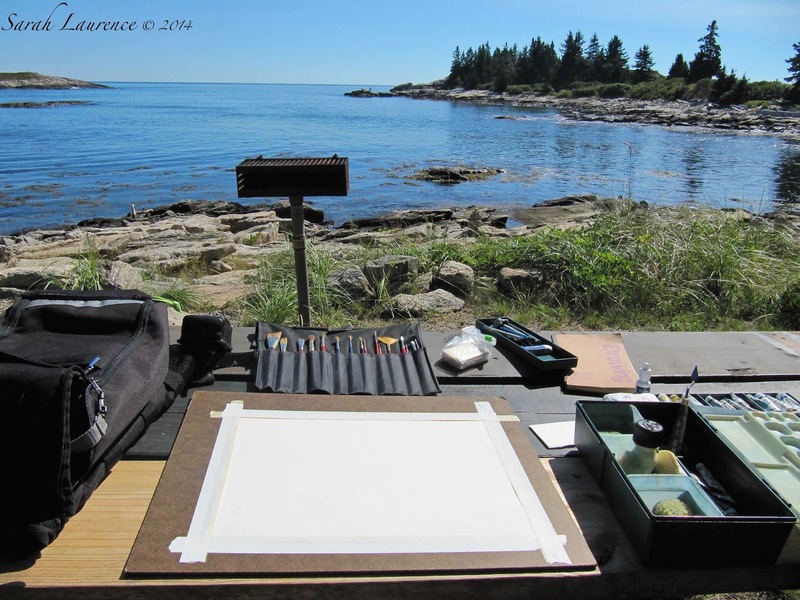 Let's flashback to September, my favorite month for painting en plein air in Maine. Working outside a studio requires meditative patience and a sense of humor about the hardships. Watercolor is the most challenging of paint media because you can only work darker, not lighter. Wet paper buckles and the paint is hard to control. Mistakes can't be erased. On the plus side, watercolors are portable and dry quickly. The flow of the paint mimics the flow of the water. I enjoy challenges. 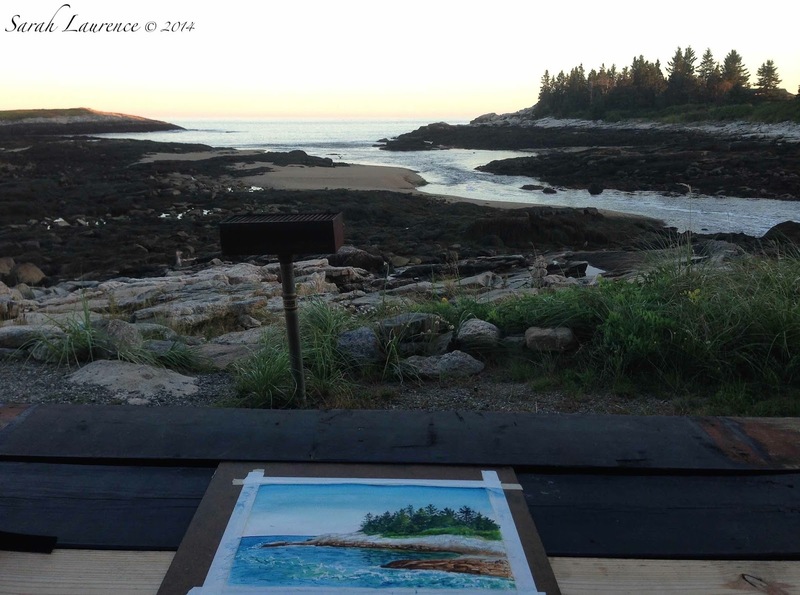 Reid State Park in Georgetown is an ideal spot for painting on location. 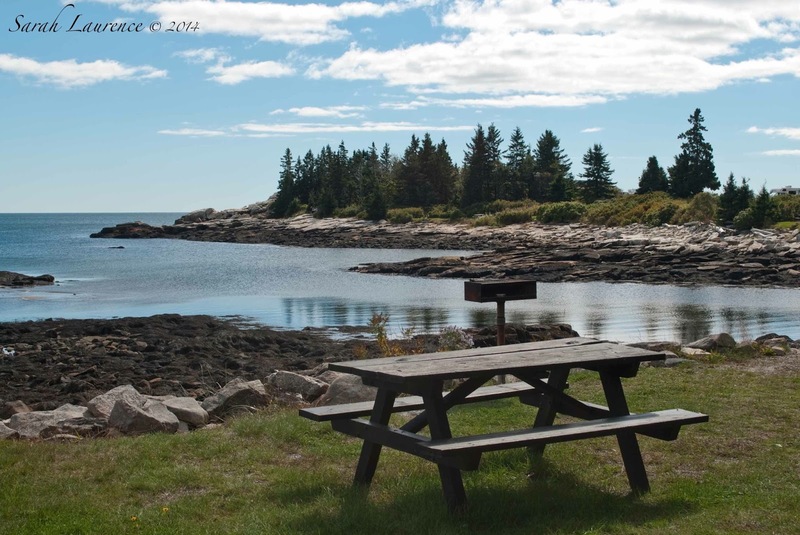 Picnic benches are set to face the spectacular views. They're popular with mosquitoes and green-heads too so I cover up and bring bug repellent. The park is a half hour drive from my house. After scouting out a location and testing compositions in my sketchbook, I line up my supplies. The first step is a detailed pencil sketch on heavy weight Arches paper taped to a masonite board. Then I use liquid masking fluid (the yellow) to preserve the white boulders and surf. After the mask is dry, I block out the base colors in thin washes of watercolor, using sponges and broad brushes. This is a leap of faith. The under drawing vanishes and the painting has to look terrible before it finds focus. As I work, the tide falls, shadows lengthen and colors intensify. 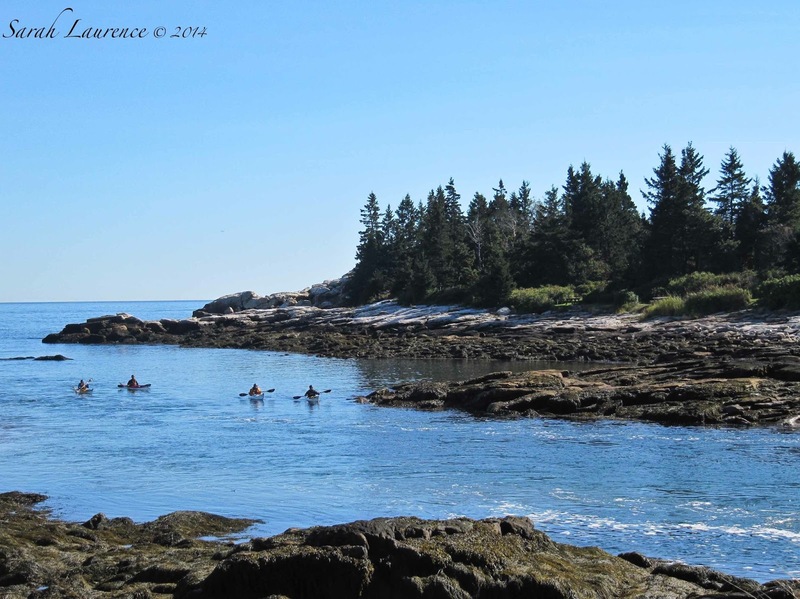 I enjoy the serendipity of working on location, of looking up and seeing kayakers paddle past. Fish jump and birds fly by. This is no still life. The details are rendered in layers of paint, using finer tipped brushes. The penultimate step is rubbing off the liquid mask. The white areas are paper without paint. The final step is working detail into the white. 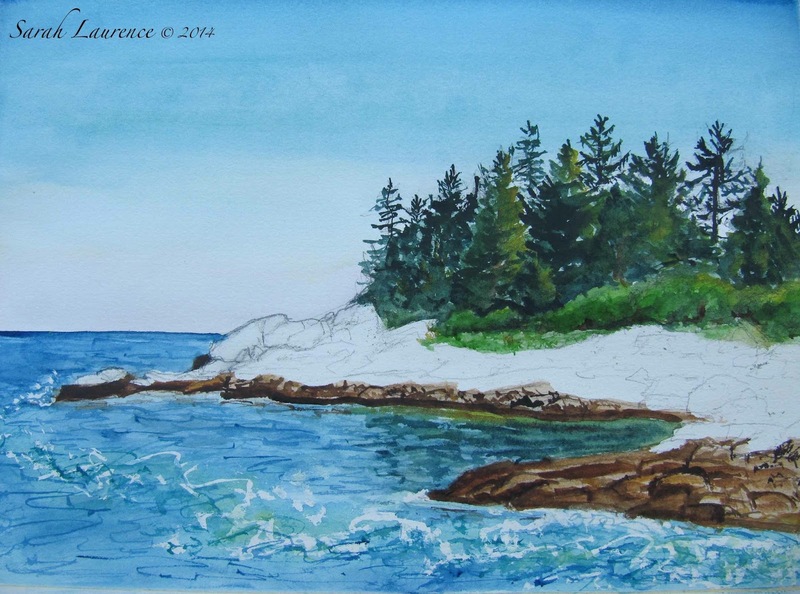 I work quickly to capture the grays, browns and blues in the boulders and the turquoise in the water. Too soon the sun sets and the tide falls. There's not enough light left to finish my painting. Bother. I pack up my paints and watch the sunset. A camera is best for capturing fleeting images in low light. 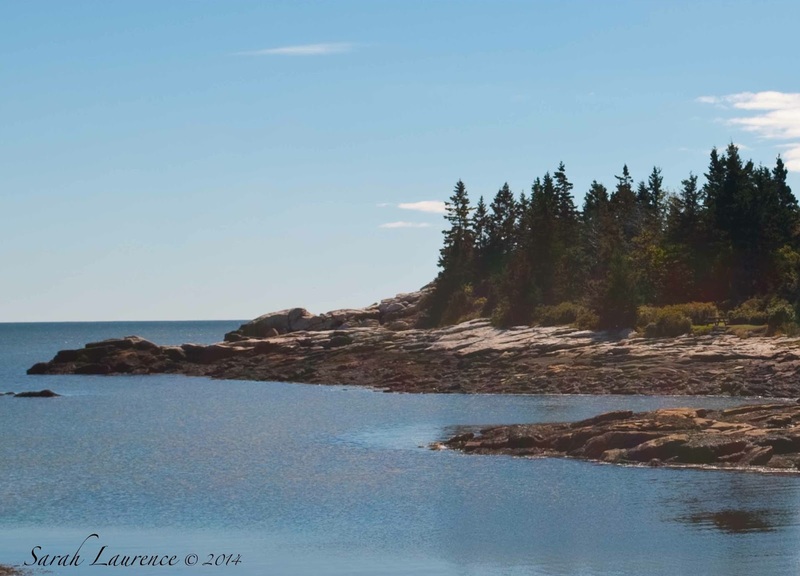 I return another clear day with a similar tide to complete the painting. 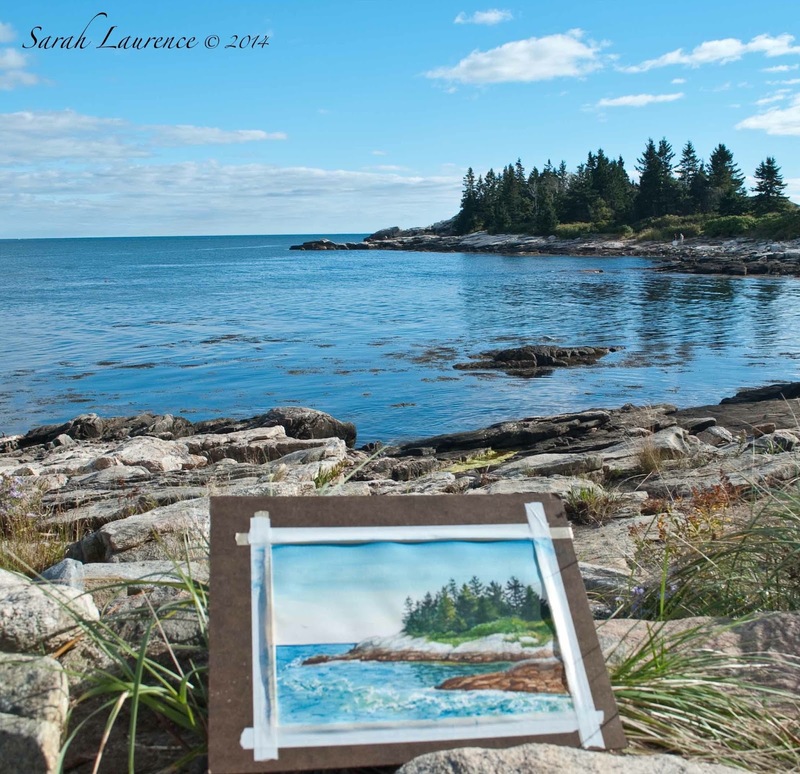 In these two images you can see the differences between a photograph and a watercolor. The photo lacks definition, flattens the perspective and has no movement. This is why I prefer to work from life than from a photo. Once the painting was done, I removed the tape that held the paper to the board. Now the watercolor is ready for framing. I'll be painting more watercolors in summer...after the snow melts. Sigh. Please share your daffodils. I used to paint and still have a whole collection of oils and acrylic. I could never ever master the art of watercolor paints so I am always impressed by those artists who can. We have quite an active art community in my small town and the watercolors are always featured. I find it most need. Thanks for the explanation about going darker and never going lighter. It is really cool the depth and the control you have over the watercolors. A beautiful painting indeed. I hope you get it finished and will post it. What a serene day this must have been! And what amazing paintings. That was really neat to see your progress as you painted- I love how not only are you an incredible photographer but an immensely talented artist as well. Those scenes are so peaceful. Beautiful! The views are amazing. It's no wonder that you feel inspired to paint. I would and I can't even draw! :-) I love your watercolours. Thanks a lot. Your painting has done justice to the original place. Like the way you have explained the process in detail. Beautiful water color!! Everything in this post is lovely, Sarah. And I also like the first and second photos. "......This is why I prefer to work from life than from a photo." When I painted in oil many years ago, I did the same way as you do. I never used photos for painting. Ironically, I don't paint at all now but only take pictures. If I had any artistic talent at all, I would love to paint in such a setting. As you described the process, Sarah, I was just thinking how relaxing this would be--you are truly living "in the moment" while you are painting. 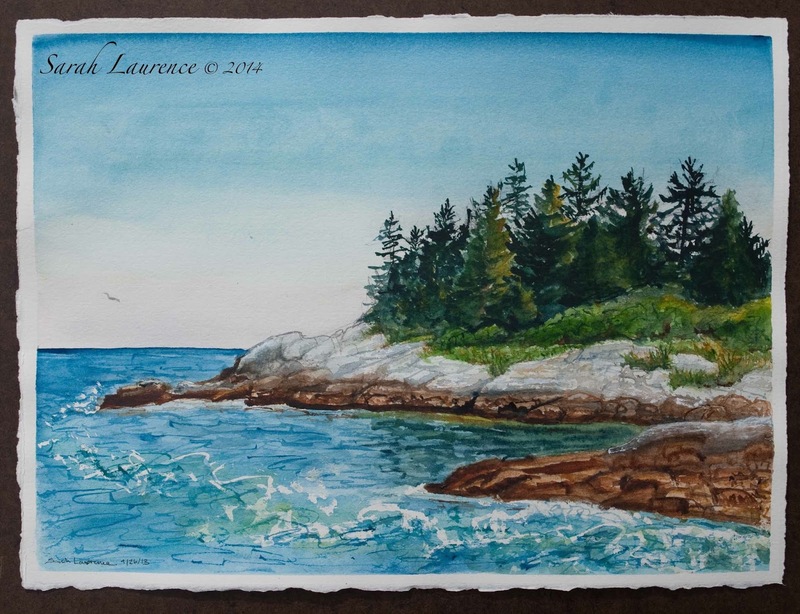 Your finished watercolor really captures the beauty of this scene. Beautiful! You're a talented artist, as well as a fabulous photographer and writer. I didn't know! I've been to this locale (or to coastline very near to it) so it was fun for me to revisit it again. Thanks for sharing! It's interesting to watch that process of creating the painting, it must be a special time spent in this way. 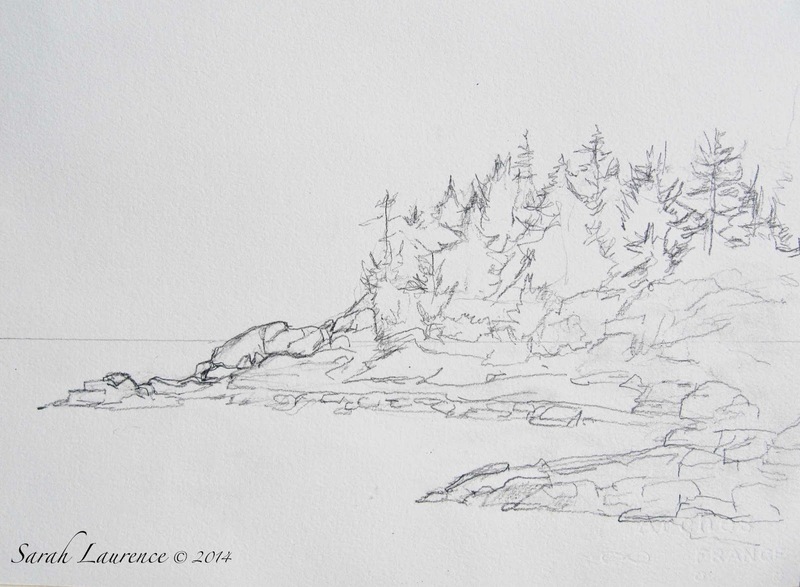 I love the watercolor, but your pencil sketch could stand on its own as well. The daffs just began to open this week, but they pale in comparison with the beauty of your coastline. 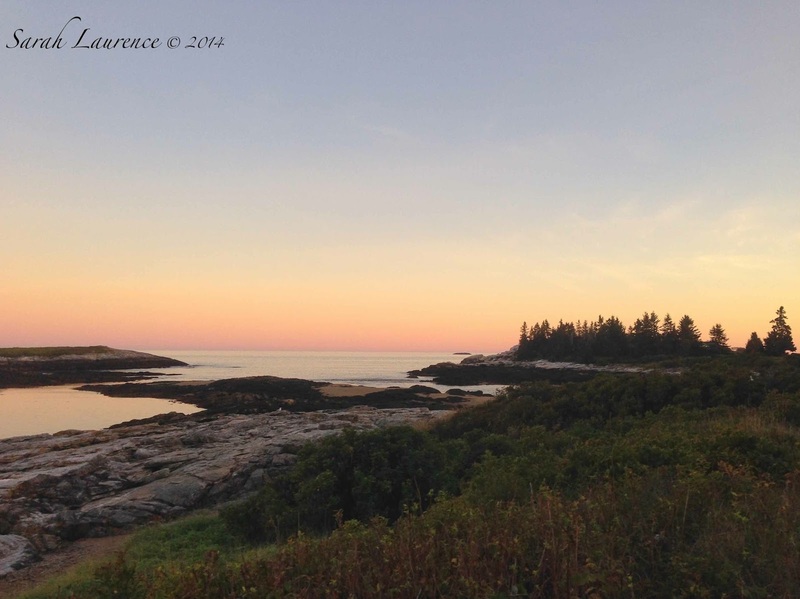 There is so much movement in your photos and paintings! Even the trees seem to ebb and flow. Lovely. Scrolling back and forth between the final photo and watercolor, both of which are beautiful, I totally see what you mean about the difference in perspective. No daffs here yet to share....not even the forsythia has emerged. What a lovely painting and place so near your home. I do love the energy and colors in your painting Sarah, and I always enjoy seeing your process. 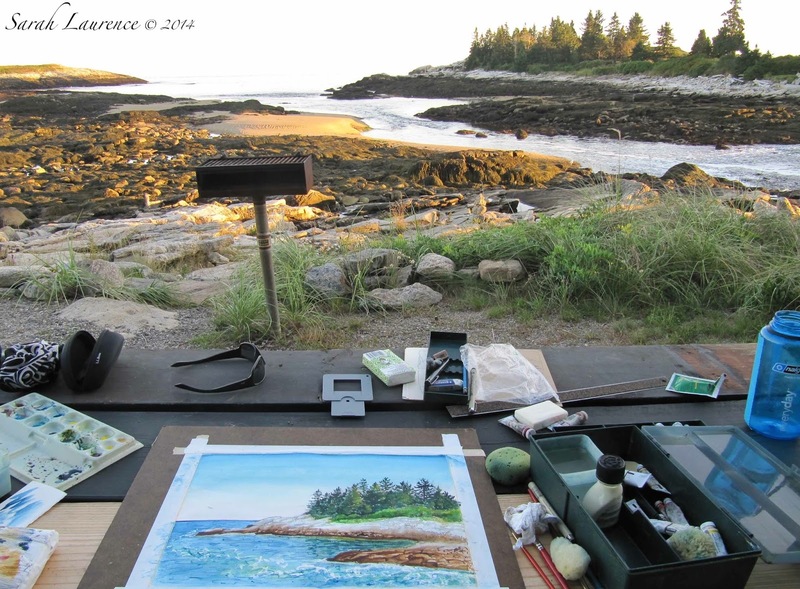 Not sure I could tolerate the mosquitoes and flies, though painting from life does give you so much more information. Watercolor is, as you say, so difficult compared with oil but well worth the effort as your work shows. Les and Charlotte, I haven't done a pencil drawing on its own in years but your comments are making me think I should go back to doing both. Part of the reason I stopped to photograph this under drawing is it was hard to lose its playful looseness to paint. Especially loved seeing your table set up! I'm a process junkie! Really beautiful work, Sarah! Watercolor is such an unforgiving but honest medium. It demands confidence!